“That’s when Jesus said, ‘With man this is impossible, but with God all things are possible.’ Matthew 19:26 is more special to me now than when I first had it done my junior year in college.” Jesus was talking about Salvation through Him. 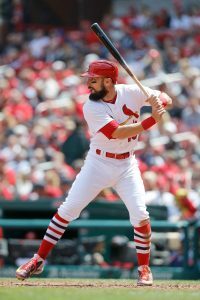 Matt Carpenter was drafted in the 13th round in the 2009 Major League draft. He made his Major League debut on June 4, 2011, as a third baseman. Matt, a 3-time All-Star (2013,14,16), had an outstanding season in 2013 when he broke Stan Musial’s franchise record for doubles in a season by a left-handed batter. Matt finished the season leading the Major League in hits (199), doubles (55), and runs scored (126), while batting a cool .318, all which led to receiving the Silver Slugger Award for second base and placing fourth in the National League MVP race. His major league success should not be a surprise. He almost grew up on a baseball diamond. Matt played his prep baseball at Elkins High School in Prosper, Texas, under his father, Rick, who has won numerous championships including one national. Matt, whose childhood hero was Lance Berkman and was a teammate with Berkman in the 2011-12 season with the Cardinals, was a high school second-team All-American and a high school teammate to James Loney, a professional baseball first baseman. Matt left Elkins High with the record of most career hits. Matt is the oldest child of Rick and Tammie Carpenter. He has a younger brother, Tyler, who is married with a child on the way, lives in Houston, and played two years in the New York Mets system. Matt has a sister, Kaitlyn, who lives in Dallas and is soon to be married. “My wife, Mackenzie, and I will be married seven years this December 10th,” states Matt, “we were high school sweethearts just like mom and dad were over 40 years ago. We have a little girl, Kinley Rae, and a boy on the way in November. It was very special we had Jake Arrieta, a college teammate who now pitches for the Chicago Cubs, as a groomsman at our wedding. We go head-to-head now on the playing field.” Matt and Mackenzie met at the baseball field. “My dad coached for many years; and before I started playing for him, I would watch his games to support him and the team. Mackenzie has an older brother who played for my dad, and she would go support her brother and the team. That is how we first met, and we started dating when we were a little older. Adam Wainwright, a starting pitcher and a Cardinal teammate, shares, “Matt is a strong brother in Christ. Matt has a good family at home, and he is a good accountability partner for me. Carpenter attended Texas Christian University (TCU) in Fort Worth, Texas, where he played baseball five years. He received a redshirt year to recover from Tommy John surgery. Matt left TCU with three second-team All Mountain West Conference awards (2006,08,09) and having broken school records for games played (241) and at-bats (843) and finished second in hits (263), doubles (57), and walks (150). Matt graduated from TCU with a degree in communications. Mackenzie, a high school athlete, attended Texas A&M University, graduating with a degree in health and nutrition. Matt and his family make their off-season home in Fort Worth, close to TCU and to Christ Church. It is a way to stay connected to the University. If so, is he doing for MLB or for Christ? Sincerely doubt he is doing these things for Christ. Not sure why you would highlight a counterfeit. Hello Michael. 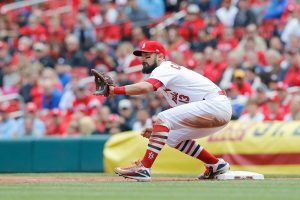 Why would Matt Carpenter get one Bible verse just for baseball, and if so, what’s wrong with that. Everyone needs Christ. He is not a “counterfeit” but if you read the article, you would know this man is a brother in Christ. I am saddened at your comment about a fellow believer in Christ who is the real deal. Having a tattoo has nothing to do with keeping one’s self unstained from the world…the stains are those of sins that the world does. Previous post: What Essential Doctrines Must All Christians Believe?